These guides have proved to be exceptionally popular, with the first seven editions having sold out. It's popularity is derived from their accuracy and detailed descriptions. Large scale contoured maps, photographs and descriptions of what is available to see, makes the Guide. Distances between various landmarks and way points are given. The guide is ideal for navigation and interpretation and designed to easily fit into a back pack. 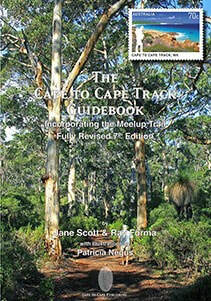 Scott, Jane & Forma, Ray: "The Cape to Cape Track Guide Book. (7th Edition)".Cape to Cape Publishing 2017 $25. ($22.50 for members). These products are available from the Friends - by using a downloaded order form, by clicking in the box below. A detailed description of some 300 species of plants that all occur along the Cape to Cape Track.. The flowers are arranged by colour for easy identification. ​With excellent photography (including some close-ups) this book is an essential wildflower guide for the Southwest region. Features entire Track on one map. Price $10 for members, $12 for non-members, plus $2 if it is to be posted. This field guidedescribes 29 circuit walks a series of well described walks in close proximity to the Track. The walks have been carefully selected to ensure a variety of difficulties and lengths. The guide is well illustrated with accurate contour maps, many photographs and an insight into the natural history of the region. The walks all finish at their starting point.. The cost is $25.00 ($22.50 members).